What’s worse than lusting after my best friend’s on again off again boyfriend? How about my dad dating his mother, and my mom redesigning his bedroom for her show? With fate interfering so cruelly, can you really blame me for putting my magic potions to not-so-good use? I’m Zoe Miller, a fifteen-year-old witch with only one power-—a talent for potions. I have my life all mapped out. I plan to be a doctor and develop drugs to cure disease. We already have potions to help all kinds of symptoms, but none of them will get by the Food and Drug Administration. I mean, the government bureaucrats are not going to okay the ingestion of bat wings or unicorn horns. Luckily, fat-free margarine has already been found to be an adequate substitute for dead man’s toe. So, I really hold out hope that I can make things work. Looking for edible substitutions to use in the potions is my passion. 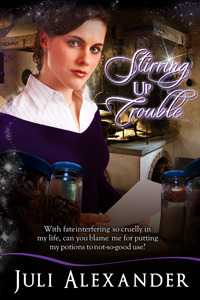 Stirring Up Trouble is a Young Adult Romance. Fifteen-year-old Zoe has managed to turn her crush into a boyfriend without using any magic at all. But can it really work with Jake when Zoe’s father is dating Jake’s mother? Talk about a dysfunctional family. Today I bring you a duo of books I picked up from Amazon. by Juli Alexander. She is new to me, but the books sounded fun and I thought, Why not? The premise is that there are witches, they can work magic, they specialize in things, and anything done with selfish intentions causes bad things to happen. I like that the Alexander wove the “bad things” into her story to explain away why popular mythology uglifies witches. That’s right, I said uglifies. Deal with it. The unlikely heroine of the books is teenager Zoe Miller. With divorced parents, Zoe’s not having happy teen years, especially since her dad decided to start dating. Ew. Gross. Parents are not supposed to date, right? That’s supposed to be left to the teenagers! In that vein, Zoe’s got her eye on a cutie boy, and wouldn’t you know it, he’s the son of daddy’s girlfriend. If it weren’t for bad luck, some people wouldn’t have any luck at all. Right? Dating hijinks, dealing with divorced parents, and a dash of magical mayhem. Bring it on.